I still have wedding hair (long hair that has not been cut in 2 years) and I refuse to cut it. I mean I have had a few trims here and there, but the long hair is starting to grow on me. Pun totally not intended here. Summer is coming (hello captain obvious) and I need to get better at being able to put my hair up in cute styles, rather than the typical pony tail I usually do. Insert some commercials here and a little advertising brain washing there...isnt that what advertisements are for? Have you seen these things yet? I just got mine yesterday. They promise to equal 20 bobby pins each, and to be honest I can't use a bobby pin in my hair to save my life so lets hope these are easier. I'm not being paid to post this, it is just my opinion- but, I tried these things last night and I just might think they could live in my hair all summer long. They really do hold it up. If any of you have better tutorials or easy ways to make these work, please share. My hair will thank you later. I bought 2 sets of these the moment they came out. As a curlyQ, it's an epic battle every day to get the hair to stay in place. 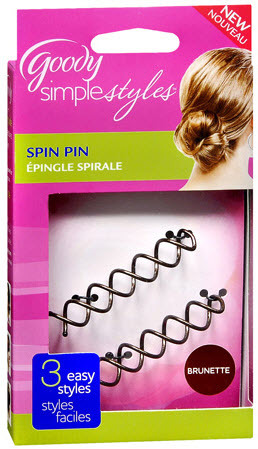 My curly co-worker agrees with me: Best Product Ever. I was totally wondering if these things work so I'm so glad you posted about them! you've convinced me, I'm adding these to my cart on my next Target trip. I bought a set before leaving for spring break when I wanted to keep my long hair off my neck but also not make me look like I just got back from the gym. I've come to realize I don't need to follow the instructions on the pacakage; I put them crosswise through my bun instead of running them parallel and it holds better. I look at them everytime I'm in CVS. Time to invest the $6.99! i always wondered how they worked! I'm a huge fan of these as well! I bought a pair for myself about a month or so back and then ended up back at CVS picking some up for my sister! We have fine-medium hair and it works great. Didn't work as well on my girlfriend that has superthick silky hair, but if she loaded her hair up with product it'd probably work a lot better! I need this, please show us a pic with it in your hair! I so so so need this! Im very impressed! does it really stay put all day? oh, man. i've got long, curly hair and i so want these! i'm glad to hear that they're worth it! i bought these... i was eh about them. it looks good- like an "undone" look but i needed more bobby pins to fully secure. I too have these. I have 3 pairs and have medium to thick hair, I without fail have to use at least for pins total each time I put my hair up. However I totally don't mind, they keep my hair up nice and tight and it really is better than 2 pony holders and 20 bobby pins! I say they work and would buy more if not for the price. I hope they sell these in Canada! I'm excited! I went out and bought these this morning after seeing your post yesterday! Love them. My hair is in a perfectly messy, loose but firmly in place bun. I am so pleased with this little product! Thank you!!! i just died when i saw this! i picked some up at the drugstore when i was just in the us and i love them!